29-year-old viral TV blogger Zaahira Ramsey has it all, except peace. She's built a fortress of protection around her heart as big as her coily hair. But when Chris Samuels enters her life, ready to unpack everything she's been carrying, will she put up a fight? Or will the scrappy know-it-all fold under the pressure?Camille Downing has lived most of her 29 years in the shadows of other people. As a top-notch executive assistant, she makes the impossible possible while taking none of the credit. But when she meets flashy and outgoing Jemel Jones, he makes her question why she's been constantly selling herself short. Can she let go? Or will he push her too far out of her comfort zone?Terry Baldwin can't even. With three kids under her belt at 29, and a husband who acts like child number four, she's slowly losing her mind. With her family falling apart at the seams, Terry decides to get a job. Can she be a full-time employee and mother? Or will the weight of adulting finally send her over the edge?With a dash of romance and humor, Pushing 30 is every millennial's life story - a tale of sisterhood, the dark and light sides of family, and what can happen when you let love in. 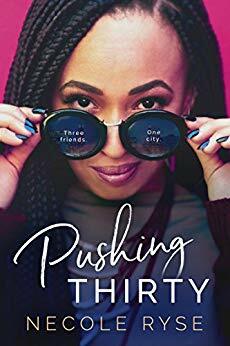 If there was one word to describe Pushing Thirty by Necole Ryse, it would be relatable. In this novel, we meet a trio of best friends on the cusp of turning 30 as they navigate love, work, friendship, and life in general. As a girl who loves the theme of sisterhood in my novels, I was drawn to this book. Camille was the most relatable to me, and perhaps my favorite. She was a whiz at her job; doing the work of many, a lot of times unnoticed. She was a bit afraid to go after a promotion that she was a shoo-in for. She struggled with getting her parents to accept her moving away from home and had to deal with the nagging questions (from her mother mostly) about marriage and children on a weekly basis. She wasn’t looking for love but found it in Jemel, an attractive fashion designer. 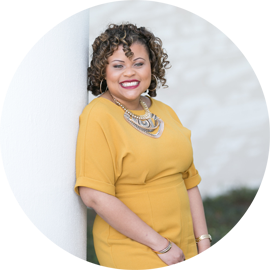 After getting drunk one night, Jemel nursed her from her hangover and they both felt a spark. Though she feels a pull, she convinced herself that he wasn’t right for her. 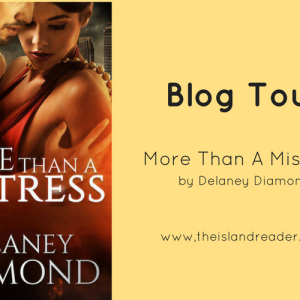 She thought he was a player and while there was perhaps some truth to that he pursed her with a single-minded focus that showed that there was more beneath the surface that she initially thought. Terry is a young mother of three struggling to figure out who she is after the birth of her daughter. She feels overwhelmed, underappreciated and unattractive. She’s trying to figure out who she is aside from being a wife and mom. Her husband, Tyler, pissed me off. While he seemed cute and attentive in the beginning, he wasn’t willing to compromise or help out much after the baby and seemed to lack basic understanding, at times. He almost blew a fuse when she started to work and I wanted to knock him upside his head. Thankfully, he got his act together and they were able to work on their marriage. I was not a Zaahira fan. I liked that she was making a name for herself as a blogger and YouTuber but when it came to the other aspects of her life, her personality was very off-putting. She just shut down a lot and seemed very stilted, for lack of a better term. I wanted to yell at her many times in her interactions with her love interest, Chris. He was a very sweet and patient man who was just trying to help and get to know her better. His intentions were always pure. There were definitely some murky parts of Zaahira’s past that contributed to her behavior a little bit, but better communication on her end would have avoided some of the mishaps with both her manager and with Chris. She did come to her senses in the end and was willing to try, so I do commend her for that. If she had messed up the good thing she had going with Chris, I would not have been a happy girl. Admittedly, I felt like I was left hanging at the end of the novel. A little bit of it felt unfinished; not in the writing but in the ladies’ storylines. I guess I wanted a bit more finality but Pushing Thirty is about the journey into adulthood and everything that comes along with it, and that’s not really ever final. Pushing Thirty is sweet, funny and like I said earlier; relatable AF. Wading through the murky waters of life and love can be a mess sometimes. 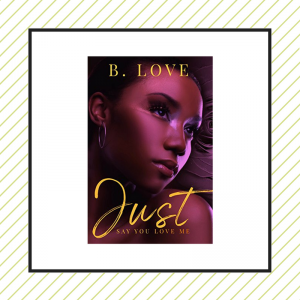 Pick up this novel for a nice dose of sisterhood and romance. Natalya is an Account Manager by day and an editor and author's assistant to passionate creatives by night. When she is not adding to her enormous book collection or stationery supply, she is catching up on her favorite television shows. Natalya is the author of All The Things I Never Said, a soul-stirring collection of short stories, prose and love letters for the soulful wanderers, the brokenhearted and the hopeless romantics. You can follow her rantings and occasional sparks of brilliance on Twitter @NatalyaMuncuff.